And just in time, too, since Fairbanks went into the high 80s on Saturday! I had to get up around 3:30 AM to catch a flight to Anchorage to catch the flight to Barrow (definitely the long way home). It was amazing flying into Deadhorse. Water everywhere, and the Dalton Highway and some other roads gone in spots. A whole lot of the snow in Barrow had melted too, but amazingly the roads are OK. The Tundra Garden is emerging from under its snow cover, and flocks of redpolls have showed up to join the snow buntings. I didn’t get much done the rest of the day except resting and a little mindless spring cleaning. We looked through a huge number of drawers. The older collections have little or no faunal material saved, so we needed to find worked bones, or in a pinch, artifacts (preferably broken and non-diagnostic types with many examples) that were definitely made out of walrus bone. That info wasn’t usually in the catalogs, so we just had to look. Some of the drawers were really full. 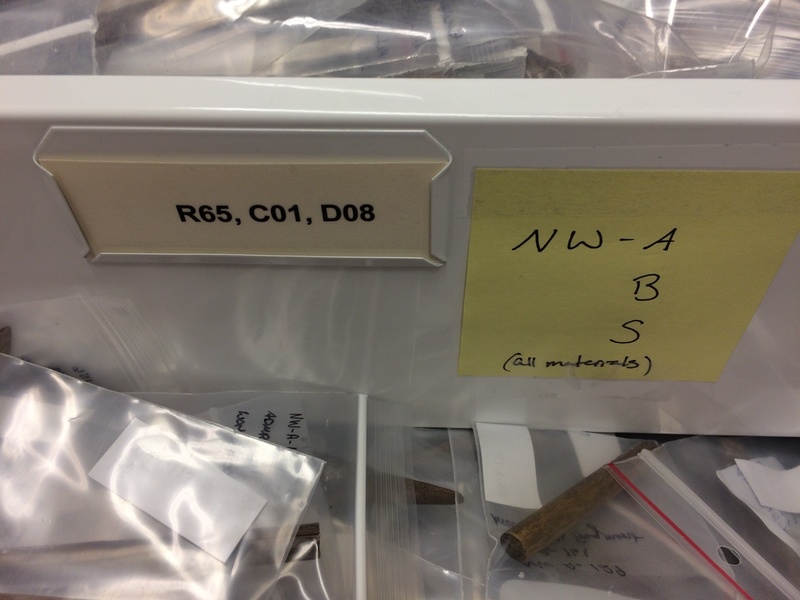 In the end, we have several hundred possible samples (plus associated caribou or wood samples for paired radiocarbon dates since marine mammals like walrus don’t give accurate C14 dates without a correction factor). Now I need to figure out which may be from the same context, so we can look at them as a group and try to eliminate duplicates. I’ve finished most of the bookkeeping paperwork that goes with any research trip, and will do the rest on Tuesday at work. I hear there are a number of applications out for the internships, so I’ll be working on getting interviews done and hiring people as soon as possible.